How was your weekend? Saturday was absolutely gorgeous outside, and we were able to pack away the last bit of outdoor stuff and pick up a bunch of leaves. If you haven’t invested in a leaf blower vac, I highly suggest it (well, my husband does since he’s the one who actually uses it!). Not only does it make the job quicker and a whole lot easier on the back, it also shreds the leaves meaning less bags. Sunday we woke up to rain that quickly turned to snow, so I was happy to have my outdoor pillows and ceramic pots tucked safely away. 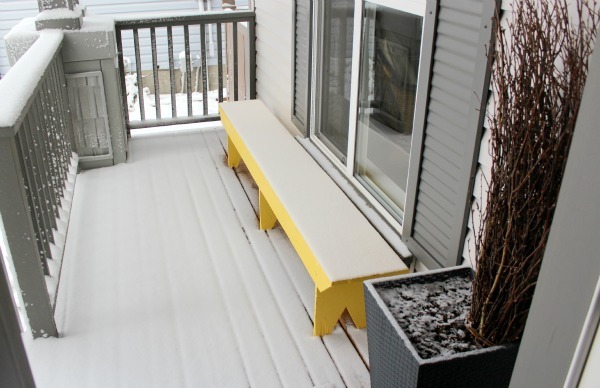 If you read Friday’s post where I kicked off the Holiday Countdown for 2013, then you know I have one item checked off on my to-do list- “Winterizing the yard and house”- yay! If you haven’t gotten around to winterizing yet, may I suggest visiting Hoosier Homemade for yard prep ideas. One thing I still want to do is change our thermostat to a programmable one. Because I work from home, we don’t adjust the temperature lower during the day unless we’re leaving for awhile. However, lowering it at night even a degree is probably a good idea to save on energy costs. Do you do this already? On another note, I want to extend a big thank you to Knock Off Decor for featuring my White and Gold Pinboard and Gold Gilded Bird Art over the weekend. If you’re looking for ideas on how to create your own budget-friendly furniture or decor, I encourage you to take a look around this site! Today I’m working on a painting project for my office makeover and hopefully a few organizing elements too. I’ll be back later this week with my One Room Challenge update. Oh my gosh, you got snow already! Still warm here, but we need to get our hoses put away and some outdoor furniture. Sending you warm wishes! It’s supposed to warm up this week, so hopefully it will be gone by the weekend. I do like the snow, but the cold is something I never get used to! Good luck with your winterizing!